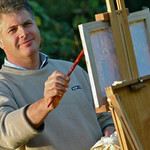 Malcolm Palmer is a respected local artist, based in Rotherham, South Yorkshire, England. He works in situ, using watercolours, oil and pencil. Malcolm regularly exhibits, and has paintings in private collections, in the UK, Spain and Germany.
" So, you can't draw "